Please, refer to step 4 on the linked FAQ. First, uninstall the graphics driver completely. And then, please install the latest version of the graphics driver and run Bandicam again. Also, please refer to the following FAQ. Hi. Thank you for the reply. I'll try this when I use my PC again. But, where do I find the latest version of the graphics driver? You can find it on the official GeForce website. I literally just went through all this as you did. Flight Sim X crashing the instant the record button was pressed. 1. 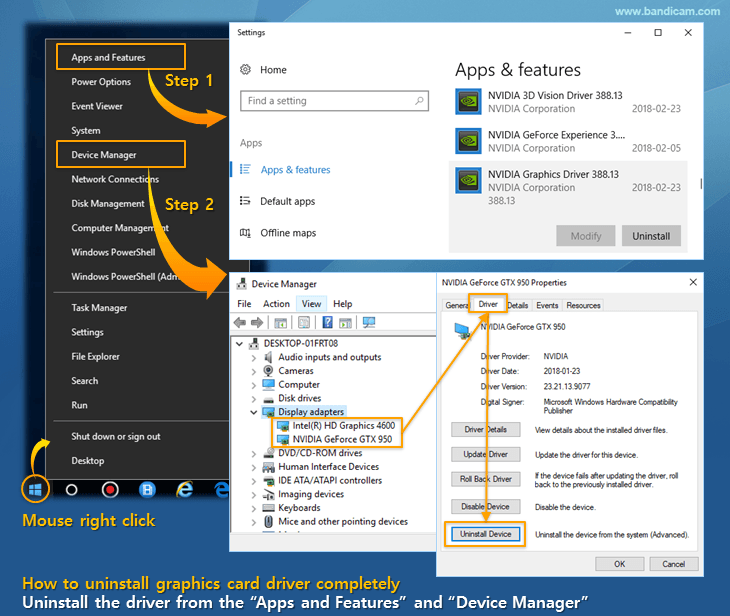 Did a thorough clean install of GPU drivers( Includes using Display Driver Uninstaller in SAFE MODE ). No good but the new drivers helped performance. 2. Did a thorough clean install of Bandicam with latest version ( which is beautiful by the way ), no good. *** 4. Turn off the FPS overlay. Problem solved. Can record all day long now. I just figured this out about 20 minutes ago. So try turning the FPS Overlay. The only issue with this is if you record FULL SCREEN like me, You do not totally know if its recording or not. Just press the record button and cross your fingers. Hope this helps! I will be spreading the word and hopefully the tech at Bandicam can figure out why the FPS Overlay is breaking our game. btw, do you record FSX on Game Recording Mode or Screen Recording Mode? I use the " Game Recording Mode " setting! Excited to here your results! Not the best news, It went back to the crashing/breaking the sim. Even tried running both under Administrator. What is really bizarre with Bandicam is sometimes it won't both recording at all. But I am seriously done fighting with it. With that being said, I have decided to go back to FRAPS. I have only used this for FSX, I think it would be a good idea to test with with some other games I have. I really like Bandicam for its wide variety of options and mainly because I can record in custom resolutions which FRAPS can NOT do. And not to mention, if I record FRAPS at 4k, It will make my system beg for mercy which is why I record in 1440p ( with zero system slow down ) thanks to Bandicams efficient program. I get silky smooth FPS in FSX at 1080p/1440p/4K with special settings. Any PC with a Skylake CPU and up will not have issues with this program anymore. So today, I will test out Bandicam some more. I just recently learned ( Friday night ) that I had my Windows Updates turned OFF ( I forgot I did this ). I had them turned off due to the CPU update thing. But I did all the updates and even ran Virus Scan ( all clear ). I will let you know my results soon. Will test now. Last edited by Yolvaah4590 on Sat Apr 14, 2018 3:28 pm, edited 1 time in total. Anyways, still no good on this program. At first, I thought it was do to near OOMing on FSX, but FRAPS or Shadowplay would have done the same thing as Bandicam. I do not understand why Bandicam does this, it is very disappointing that I paid for a product that does not work correctly. I also took the time to use other video games such as the first Dishonored, same thing, made it crash. Dishonored 2 however was fine, Skyrim and Just Cause 3 was fine as well, no crashing for those 3 games. So I have finally decided to just stick with FRAPS until Bandicam tech people figures this out. I am so behind on work for YouTube due to this nightmare. I NEVER have crashes with FRAPS or Shadowplay recording the exact same stuff.